It’s finally Baby Time here at Mama’s! After 40 long weeks of waiting, we finally have a Baby Girl at our house to love on! 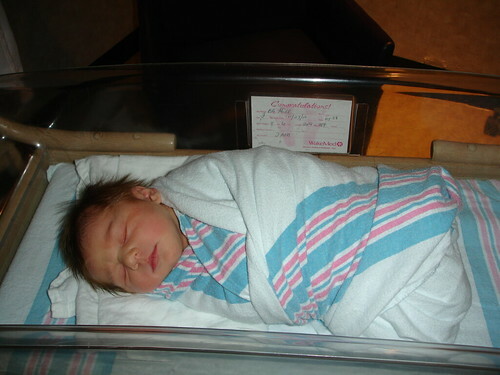 Anna Faye was born on Tuesday morning, weighing 8 lbs. and 6oz. Her birth had some scary moments, but thankfully all turned out well and we are both healthy. Anna is a fantastic nurser and sleeping as well as any baby should at this age! And she is just so sweet, I could look at her precious little face all day! 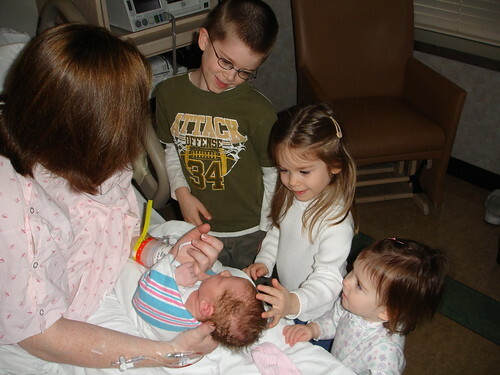 Her big brother and sisters are purely smitten with her. It is so wonderful to watch! Even Sadie (19 months old) is just thrilled with her…and I had my doubts that she would be! But she runs to her shouting, “Baby! Baby!” and wants her turn to hold her. There are fewer things more warming to a mother’s heart, than to see her older children be so thrilled about a new sibling. Thanks to all of you who sent me warm wishes and prayed for me during the past few weeks. God has blessed us with a true gift from Him, and I couldn’t be more grateful! beautiful! i am so happy for you and your family, reminding me how much we all have to be grateful for! Thank you, Crystal! Yes, the laundry blog can wait…but our actual laundry? Yikes…. Yes, it was a wonderful Thanksgiving gift! I am so grateful for her! Anna Christine – beautiful name! Congratulations! Anna is BEAUTIFUL (and you look pretty darn amazing as well!)! So great to see the others so excited – looks like you had a lot to be thankful for this year! Blessings! Huge congrats — and look at that head of hair!!! Oh, she is just precious! 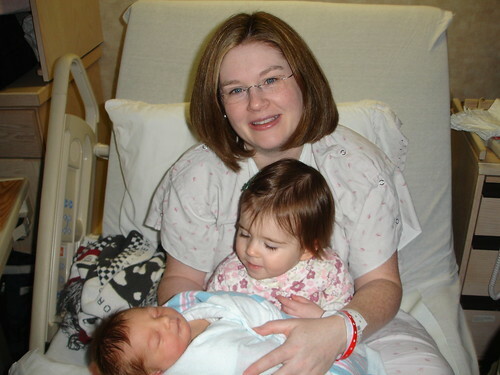 Love all of that hair – both of my babies were born with heads full of hair, too. Glad to hear that you and Anna are well, and it sounds like the transition for everyone is going well. Take care, and I’ll look forward to hearing more about laundry when you are back! Wish I could be there to do your laundry for you!!! Enjoy every minute of that baby! Congratulations! Congratulations! She’s beautiful! I love that head full of dark hair. Both of my girls were hairless for a really long time. You have such a beautiful family. I wish you all the best as you adjust to live with a new family member. She’s so adorable (and so much hair)! Congratulations to you and your family. Congratulations on your beautiful baby girl! She is beautiful. CONGRATS!! She is a doll. My brother and SIL just named their new baby Anna. I love that name. *sigh* So happy for you! Gorgeous — both you and the babe! Congratulations, Lauren! Anna looks beautiful, and look at how cute you look! I’m sorry that the labor was scary, but glad that you’re both well now! 🙂 You have such a beautiful family! She is absolutely gorgeous! I hope I get to meet her in person! Blessings to you and yours and MERRY CHRISTMAS! Congratulations! What a doll and all that beautiful hair! Yeah! I’m so excited for you. What a beautiful family you have! What a beautiful baby and such lovely children. Glad she is here and you all are doing well… it will be a happy holiday at your house. She is beautiful and so is her name! My daughter’s middle name is Anna, so I’m biased about that. Thank y’all so much for the congratulations and warm wishes! Anna is already 2 weeks old (today!) and her little face is changing moment by moment! Things will probably stay on the quieter side here at Mama’s through Christmas or so until we get more settled. Thanks for continuing to be faithful readers! Congrats on your new little one! Couldn’t be anymore perfect considering she was born on my birthday and has my name! Best wishes to you and your family! The pictures are beautiful and you look great for just having a baby! My life has been in chaos and I am so sorry I missed this. I am so happy for you and she is beautiful!! Congratulations! She’s just precious. Your whole family is beautiful, and I trust you enjoyed a very special Christmas!